Battle is the core of Lords Mobile, your strategies and your Might defining whether you win or lose a battle. No-one likes to lose, so you always need to play smarter than your opponent to minimise your losses. I will share with you some of the strategies I use in war and hope you will use them to gain victory. Use heroes that match your troop type. Select your war Equipment and Talents – easier if you have 'Quick Swap' & 'Innate Talent' Research under your belt! This strategy is to wait until the enemy attacks and to attack him back while his troops are divided. It is used to be able to beat someone with higher Might than you and works best for an opponent between 25 to 45m Might or an opponent with a lot of troops. Don't forget to shelter your remaining troops in the shelter or you are gonna be back-stabbed too. This strategy comprises synchronising your attack with the return of the enemy troops – just 1 second later to avoid their shielding or sheltering. To use this more efficiently, I recommend you use an alt account to watch the enemy troops – while, with your main account, everything for the attack is at the ready. This will help you achieve a successful attack. I think everyone knows what a trap account entails, but my battle guide would not be complete without it. First you need someone with good research and gear and a capacity of 1,000,000 reinforcements or a high Might player with T4 who is garrisoning. You just need to fill his reinforcements and use an anti-scout and wait for someone to hit you. Note: Garrison troops sit in front of your guildmates castle. The invading army will hit the garrison first (without help from the guildmates traps, etc.). If your equipment and research are powerful than the one you gonna support, I would recommend you go for this, as it will allow you to bring heroes and use your own talent tree. 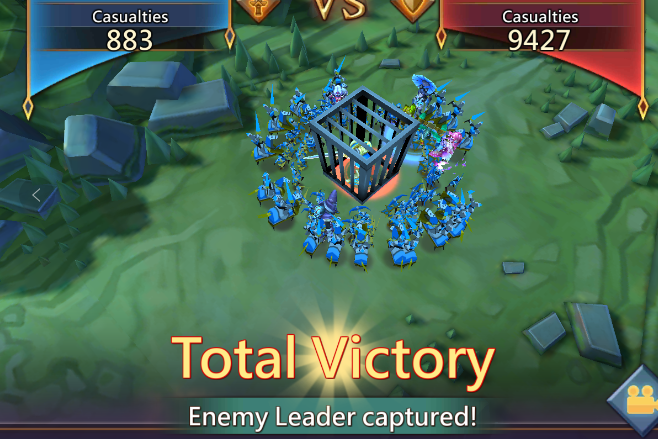 Reinforcing your guildmate will put your troops within their ranks and you'll have their wall, traps, and troops with your own. In other words, your troop will share your teammates' buffs. When you want to Rally, the best way to succeed is to confuse the enemy by doing 5 Rallies at the same time on 5 different players of the same Guild (of which 4 of them are fake Rallies). You need to send just 1 troop to the 4 fake Rallies to make them appear realistic. It will be harder for the enemy to reinforce their teammates because they don't know exactly what is going on and cannot know which one is the real Rally. Don't forget that you can always see your attacking troops in your watchtower, so it can help you to know if you are gonna win or lose your defense and you will know which are the fake Rallies. You have 800k troops and you attack someone with your friend. Suddenly a Titan appears (we call a player with T4 troops a Titan) and start to attack you and you have 10 sec before being hit. Firstly you shelter leaders and troops. Secondly, you go to the map and you reinforce your friend and then you fake rally the Titan. With any remaining troops you try to reinforce another ally or you occupy a tile for the moment. Recall them later and choose a random ally to reinforce. (210k shelter +200k reinforcements + 200k fake Rally). After this the Titan has 15 minutes of Battle Fury and you can plan your counter attack with your guildmate. The more troops you have, the harder it is to protect them. Ranged: No good F2P helmet, you should try to make Ancient Hat but you need Rare Grim Reaper Loot. What the best troop composition? Focusing on 1 troop is really good at low level and for people who play with a team. Why? For a team it's easier to beat a big target by using a counter, (Cavalry first, 2nd ranged, 3rd Infantry). Its not worth doing this on a high might because you will be easily countered and you will be unable to send appropriate troops in a Rally. This one is my favorite because it's harder to counter and can make you get the best stat from the Hero in attack and def. (number of hero of attack OR defense on one kind of troop are limited for f2p) With this one I recommend a mix of Cavalry & Ranged but every option is viable – some better than others. This one is the best for a player who doesn't attack but joins Rallies a lot because you will be able to send a good amount of each type of troop and is hard to counter but weaker on ATK and DEF stats. Are Siege Units a Worthwhile Build? Siege units are kinda useless most of the time except to break a really strong wall, to slow down troops or for Gathering (T1 siege) Why gathering troops? Because your Siege Engine are the last to be hit in your Castle, they wont steal beds in your infirmary from your T3s. Which Leader to Upgrade to Gold? Trickster, Scarlet Bolt and Sage of Storms (I recommend Sage of Storms or/and Scarlet Bolt because, at a low level, construction is more important than research). After this you will need to upgrade your Arena, your war and DEF Heroes to rank 8 (or the max you can). Then you will need to choose between focusing Hero for Arena, attack or defense (a hero can be all 3, so choose wisely. If you are just joining Rallies you should focus on Arena Heroes. If you are attacking choose ATK Heroes and DEF Heroes is if you want to be a trap account (or if you want to maximize yourself on defense). Are Battle Stats Used while Attacking without a Leader? Previous Previous post: Lords Mobile Event Preview: Who Will Become the Baron?